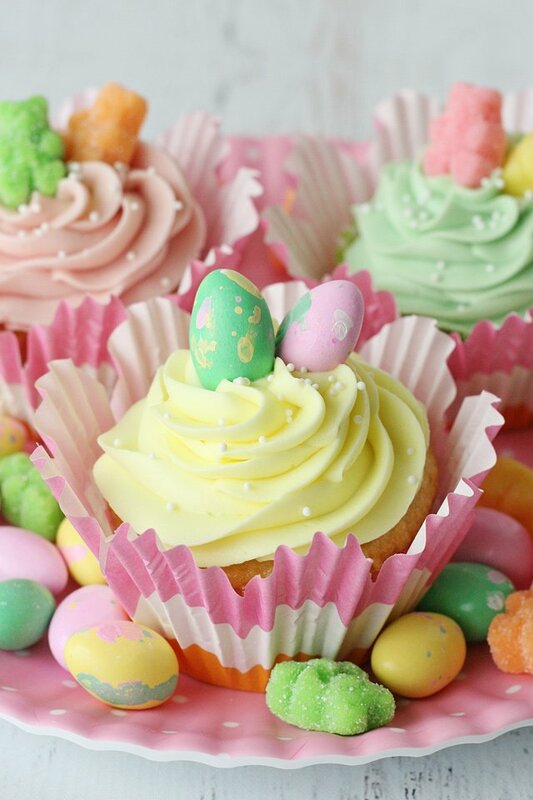 These Easy Easter Cupcakes prove that you don’t need complicated techniques or decorations to make pretty holiday treats! 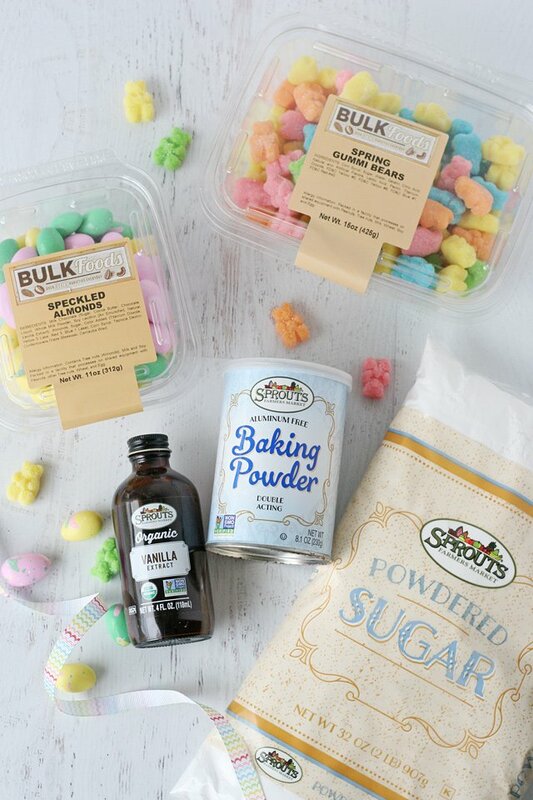 These cupcakes start my perfect vanilla cupcake recipe, are then topped with delicious cream cheese frosting and pretty pastel candies from Sprouts Farmers Market. 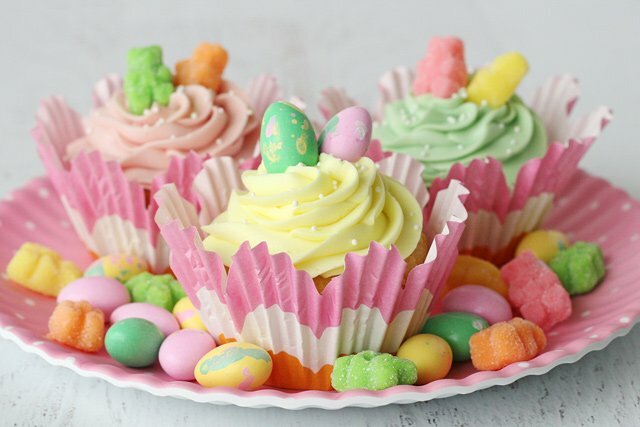 My inspiration for these pretty spring cupcakes came from my weekly visit to Sprouts Farmers Market where I discovered lots of pretty pastel candies! If you’ve spent much of any time on my site you’ve likely noticed that I have a “thing” for pastel colored sweets. So when I saw these adorable spring colored gummy bears and pretty pastel speckled almonds at Sprouts, I knew they had to come home with me and be added to something cute! I love finding new products every time I shop at Sprouts. Each season I am able to find fun new treats to add to my recipes, along with all the pantry staples I need to stock up on. 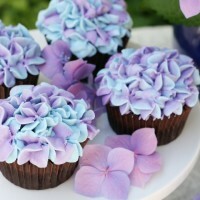 For these cupcakes I used Watkins Natural Food Coloring, found at Sprouts Farmers Market. I have a full blog post, including a simple video showing How to Frost Cupcakes if you need any tips before you get started. The cupcakes pictured here were piped using a Wilton 1M piping tip (forever my favorite). I baked the cupcakes in standard paper cupcake liners (you can use white or any you have on hand) and then I set the baked and cooled cupcakes into some fancier papers I’ve been hoarding for a couple years. 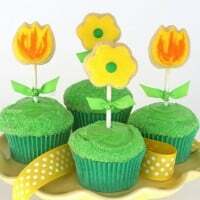 Here’s a link to a similar set of cupcake liners. 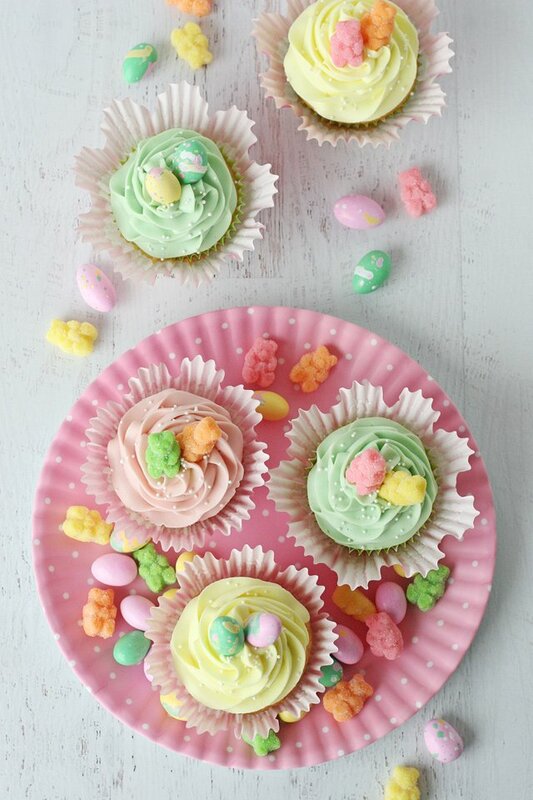 Looking for even more pretty Easter treats? 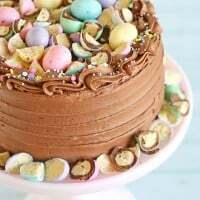 I have a full collection of Spring and Easter Desserts HERE. These perfectly cute cupcakes can be adjusted for any holiday or special occasion. Preheat oven to 350°F. Line a cupcake pan with paper liners. In a medium bowl, add flour, baking powder, baking soda and salt. Stir together with whisk, and set aside. In the bowl of an electric mixer, add eggs and beat 10-20 seconds. Add sugar and continue to beat on medium speed about 30 seconds. The mixture should be thick and fluffy. Add vanilla and oil, beat. Reduce mixer speed to low and slowly add about half of the flour mixture. Add the milk, then the rest of the flour and the sour cream. Beat until just combined. Scrap down the side of the bowl. The batter will be thin. Pour (or scoop) batter into a cupcake pan prepared with paper liners. Fill liners about 2/3 full. Bake cupcakes in pre-heated oven for 12-14 minutes. Watch cupcakes carefully. 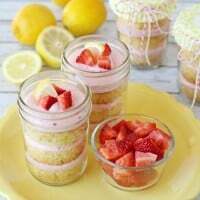 The cupcakes are baked when the tops have a slight dome and the tops no longer appears moist in the center. The edges should be golden brown. Place the butter in a large mixing bowl and beat until smooth. Add cream cheese and blend until fully combined and smooth, about 30 seconds. Add powdered sugar one cup at a time, while slowly blending. Add vanilla, then add the heavy cream, one teaspoon at a time until desired consistency is met (if your butter or cream cheese were warm you may not need as much). Use at once or keep refrigerated. (This frosting will keep well in the refrigerator for several days, but you may need to re-beat it for the best texture). 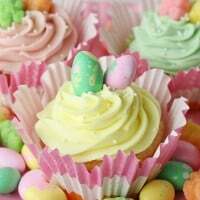 Top frosted cupcakes with pretty Easter candies if desired. Flour - Be sure to measure the flour properly. Flour should never be packed into the measuring cup. I would suggest using a whisk to fluff up the flour in the bag or canister (whichever container you use to store your flour), then scoop the measuring cup into the flour. Fill to overflowing (without compacting), then level off the measuring cup with the back of a butter knife. As an alternative, and for an extra tender and fluffy texture, use Cake Flour in place of the All Purpose Flour. For this recipe use 1 1/2 cups sifted cake flour in place of the 1 1/4 cups all purpose flour. Pastel prettiness perfect for printemps! Lovely as always! So perfect for spring and Easter!